I described a recent concert as “new music,” prompting the inevitable question, “So what is new music?” Technically, new music would be music that has been recently written or created. Music of the 21st century versus earlier eras. Music in its nascent premiere state. More often the term is applied to music that defies classification as jazz, classical, bluegrass, what have you, and specifically to music based in experimental forms and formats. One could easily argue that “free jazz” or “free improvisation” is always “new music.” Pick your definition. Whatever it is, there’s been a lot of it around town lately in diverse contexts, from community theater stages to music school auditoriums to renovated industrial sites, in forms and instrumentation as diverse as the venues. And while it would be a stretch to include it all under even the broadest “jazz” label, it all contains at least one element critical to jazz—the element of surprise. That surprise might be as small as a sudden change in dynamics or rhythm or as overwhelming as a human voice soaring over remotely activated electronic thunderclaps. Or a Norwegian cattle call inserted in a country jig. Consider some of the music heard over the past few days in the Twin Cities. St. Paul Chamber Orchestra, Chamber Music Series (March 26, Capri Theater). This season the SPCO is providing a series of free concerts in the heart of the Minneapolis northside. This performance included six works for no more than five musicians, ranging from solo marimba and duo trumpet fanfares to wind quintet, with the oldest composition written in the late 1940s and the newest from the late 90s. So how is this “new music” when it’s all been around for more than a decade? For an audience largely accustomed to more traditional classical works in a theater known for swing and blues productions, likely this concert marked a number of firsts—probably the first solo marimba performance, probably the first duos for violin/marimba and violin/djembe; probably the first Stravinksy fanfare. Certainly the marimba/djembe and Stravinksy fanfare were firsts for me, and I get around. That element of surprise came through in the instrumentation alone, as well as in the single and collaborative voicings. 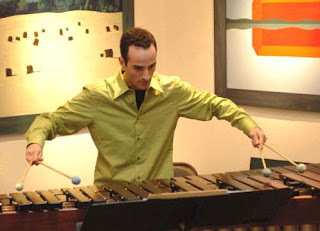 New to the SPCO, principal timpanist Michael Israelievitch delivered the melodic centerpiece, a six-movement work by Jacob Druckman for solo marimba, aptly titled “Reflections on the Nature of Water.” Through his choice of various mallets, Israelivitch’s “reflections” varied in nuance just as water, in droplets, cascades or tumult, creates divergent images and sounds. Irving Fine’s “Partita for Wind Quintet” was a fascinating menagerie of harmony via flute, oboe, clarinet, bassoon and French horn. Ruggero Allifranchini joined Israelievitch on Michael Colgrass’s “Hammer and Bow” (Fantasy for Violin and Marimba), and the duo finished the evening with Israelivitch moving to djembe for a reading of Chriastian Woehr’s “Djembach.” Here Baroque concepts collided playfully with African percussive abstractions. Each half of the program was introduced by a fanfare for two trumpets, first a variant on 17th century welcomes written by SPCO harpsichordist Layton James, and second the very modern sounds from Stravinsky, actually written some 30 years before James’s. It’s new programming and the level of applause suggests there’s a welcoming audience. 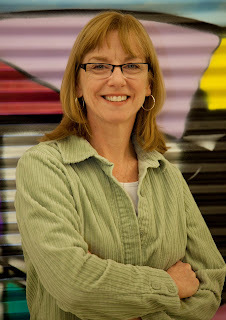 “Life, Love, Questions and Cows” (Songs by Judi Donaghy), Live at Five at McNally Smith College (March 29). Of course compositions performed for the first time are “new music.” Although she has written songs in the past, vocalist Judi Donaghy has mostly performed others’ works in her spare time while running the voice department at McNally Smith. The college’s Live at Five series offered her an opportunity to return to songwriting, yielding a college all-star show with Judi in the role of composer, singer, producer, and arranger. The music ran a stylistic gamut from blues and Latin to hymn and hip-hop to swing and cattle call. Yes, cattle call. One of Judi’s McNally colleagues, Peggy Larson, has studied folk music from here to Oslo, adding Norwegian cattle calling to her repertoire. So naturally Judi had to include a swinging back country jig in the playlist, giving Larson a chance to show off an elastic voice as likely to bring attention from Garrison Keillor as from any wandering livestock. But it was perhaps the new hymn written for pianist/vocalist Lori Dokken that lingered longest in the ear. As Judi said in introducing the song, Lori can sell the lyrics, the feelings, like no one else. We can hope that the success of this production will spur Judi to more songwriting. And maybe more performing as well? House of Mirrors IV – Experimental Improvisation/Interactive Sound Installation from Ann Millikan (Hamm’s Brewery, March 29). For me it was a double header night, one demonstrating that “new music” goes in many directions. The first three installments of Ann Millikan’s House of Mirrors passed me by, somehow. Funded in party via the McKnight Composers Fellowship Program, eclectic composer Millikan created a multi-part “installation” that “focuses on the internal experience of the performer…where the performer is surrounded by sound and stimulus both internally and externally… Various materials are given to stimulate improvisation: the score, resonant surfaces which are excited by using modified speakers, and ‘sound boxes’ that are manipulated with the feet.” Think of it as music in four dimensions. The earlier installations were based on music composed for single musicians, and included bits of narration about the history of the surrounding Swede Hollow community, which for years was anchored by the Hamms’ Brewery, now a collection of artists’ studio spaces. For House of Mirrors IV, Millikan brought together six musicians who had been the individual foci of previous segments, now functioning as two trios. It’s not your usual music space. Aside from the open ductwork, the “stage” was set up with various stations of apparatus, as easily identified as a huge bass drum to hanging gongs to odd Rube Goldberg contraptions. Ann explained that by placing modified microphones around these props, new sounds could be created as the musicians passed by. Her “sound boxes” were filled with empty plastic CD cases, ripe for crackling additions when tossed about by passing feet. With the stage set, the first trio entered—vocalist Maria Jette, violinist Kathryn Bennett and bass clarinetist Pat O’Keefe. For the next 25 minutes or so, the musicians wandered around the stage, engaging the microphones as collaborators atop their own sound creations, prompted minimally by the composer’s suggestions. After an intermission, the second, all brass trio provided a structurally similar, sonically very different, equally spontaneous and interactive work, with trumpeter Geoffrey West Senn, tenor saxophonist Scott Fultz and tubist Stefan Kac. This second act was more percussive, darker, more dangerous, a perfect soundtrack to a sci fi or horror film. Even the overhead vent system seemed to blow on and off as if intentionally joining the fray. I lamented recently about the dismally small turnout (9) for a concert of new experimental music. House of Mirrors IV drew at least 50 to a far more remote venue. Maybe some were there because it was in fact based in their community. The man seated beside me confessed that he came hoping to learn more about Swede Hollow. He was a retired worker at the brewery and was curious about the use of the space. He was not expecting new music or free improvisation or gerry-rigged microphones. But he listened through both sets and admitted that he even liked some of it. That’s what’s fun about new music. It’s new. It’s filled with surprise. And you might like some of it.